Smash Frenzy 3 Game Review - Download and Play Free Version! 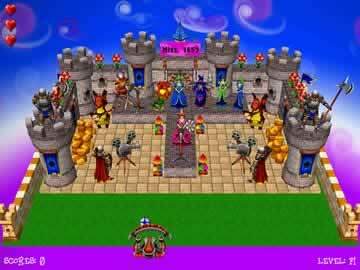 Smash Frenzy 3 offers sharper graphics and the same fun, brick busting game play that made the previous games a hit! More great Breakout style action! You've been there before. You know what to do. It's time to summon the Smash Frenzy that will undo the wretched sorcerer's spells and set the items he's stolen free. Only then can they return to their rightful place in the universe. Featuring a stunning degree of visual detail and as much madcap fun as we could cram into one release, Smash Frenzy 3 has changed Breakout games forever. The task before you is challenging. It's also filled with incredible sights and sounds! So take a deep breath and then download the adventure of a lifetime! Smash Frenzy 3, the latest installment of the series, puts you in charge of once again destroying the evil mage and saving the world. In this game you will experience 3D Breakout style action like never before. Along the way you encounter a large variety of maps and worlds all full of interesting characters and elaborate setups for you to smash. The evil mage is back at it again (for the third time) so it is up to you to battle your way there and destroy him. 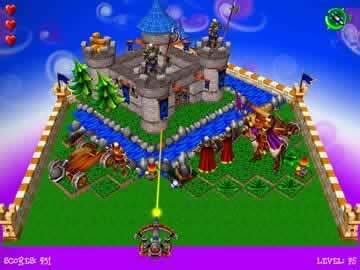 To get to the mage you have to face 80 levels worth of enemies and obstacles. Along the way you have to smash islands, forts, sharks and a host of of other objects to complete each level. All the levels will take place in four different worlds, each with a unique theme. For example, the first world places you in a pirate themed world full of sharks pirates and gorillas. 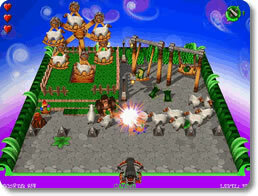 One unique aspect of Smash Frenzy 3 is the physics engine that controls the environments. All the items interact appropriately. When you knock over a box it will fall down and knock over other things along the way. This makes for some pretty spectacular crashes as you smash through the levels. The graphics in the game are great. All the levels are well detailed and in full 3D appearance. All the pirates and sharks interacting add a humorous effect to the game. In one level a bunch of sharks are playing poker. The sound is another great quality of the game. When you hit a pirate they shout, even cats let out a meow when you bump them with your ball. The sound and graphics really help make this a great game. This game really only lacks in a few areas. There are no difficulty settings, so if you find the game too easy or too hard there is no way to adjust that. The levels do increase in difficulty as you go, but it would still be nice to adjust the baseline difficulty. Another issue is with clearing the levels. If you happen to miss the token that advances you to the next level you have to clear all the items from the screen to advance. This can be very challenging to accurately control the ball. You might find yourself spending ten minutes trying to break one box. With eighty levels in four worlds you won't soon run out of things to do. Easy controls and a humorous environment make this game playable by anyone. The whole family will love playing Smash Frenzy 3. Who wouldn't enjoy smashing pirates, sharks and gorillas all in one place?